Dr. Scrattish became director of education for Med Flight in 2010. His educational interests include emergent intubation, rescue airway techniques, and pediatric trauma. 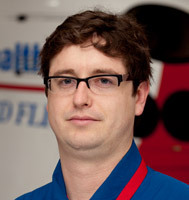 Dr. Scrattish has been a member of the Emergency Medicine Simulation group since 2011 and has run numerous simulations for the emergency medicine residency as well as for the Med Flight saff. Dr. Scrattish is also the patient relations liaison for Emergency Medicine and faculty organizer of monthly patient outcomes case conferences. Dr. Scrattish's research interests include utilizing advanced simulation to evaluate intubation techniques.